Chinavasion Has Announced the Fourth Sweepstakes! 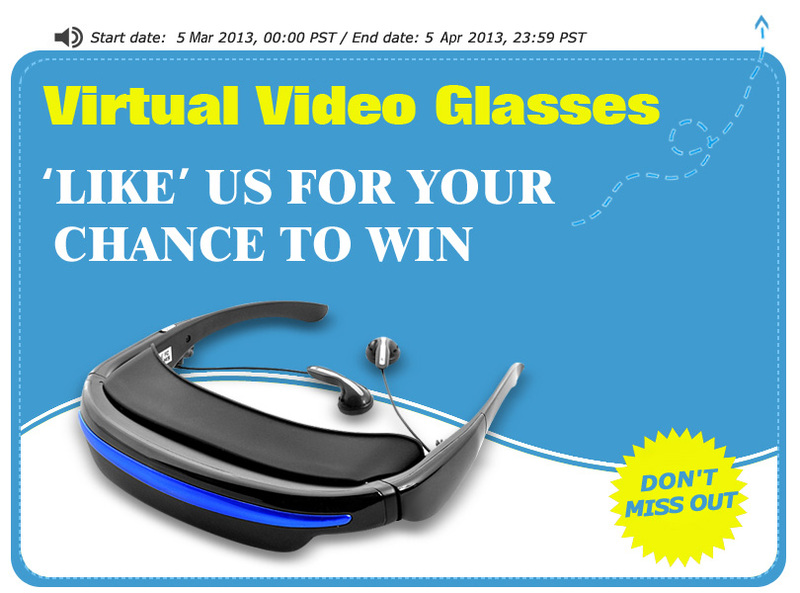 Now who wants to win Virtual Video Glasses ? This virtual screen video glass provides the ability to have a gadget that you can carry around that offers a cinematic experience with a surround sound system. This awesome industry leading portable cinema screen video glass with AV function and great optical and sound quality makes it possible. This unique device simulates a 52 inch built-in crystal clear virtual cinema screen that makes you feel as if you are in the real theater! This product is not just a gadget; it’s your personal entertainment zone where movies, TV shows and games come to life! Moreover, it has a fashionable blue and black design that matches with all your outfits. In case you haven’t noticed, our fourth sweepstakes has just started in today. This might be your chance to win this amazing phone, so enter today! Remember, more shares means more entries, and more entries means more chances to WIN! Last but not least, the fourth like-us campaign will be ending on April 5th. For people that haven’t entered the campaign yet, this is the perfect time! Enter Page: Chinavasion March Sweepstakes!